I think my husband is part fish. When the temperatures begin to increase, he craaaaaves water. Not to drink, but to swim and frolic. Well, I should clarify…he doesn’t really frolic, but he does squeel…a manly squeel and dance…a manly dance. It’s a good squeel…like a kid discovering a never-ending stash of gummy bears…or me discovering a never ending stash of kale. Don’t judge. He scoured the web for swimming pools in KC as the temperatures climbed higher and higher, topping at 107 F over the weekend. Luckily a friend allowed us to crash her apartment pool this weekend, quenching his need to be submerged in liquid. It was wonderful. I had forgotten how luxruious it feels to lay by a quiet pool sipping a cocktail, wearing big Jackie-O sunglasses, and munching on snacks. This weekend has solidified that my next purchase will be a kiddie pool to place in my tiny tiny tiny yard…Oh and to get some tiny unbrellas for my cocktails. Every girl deserves these two things! Wait..we also deserve pedicures…and great friends….and brunch…and…ok, ladies deserve a lot. 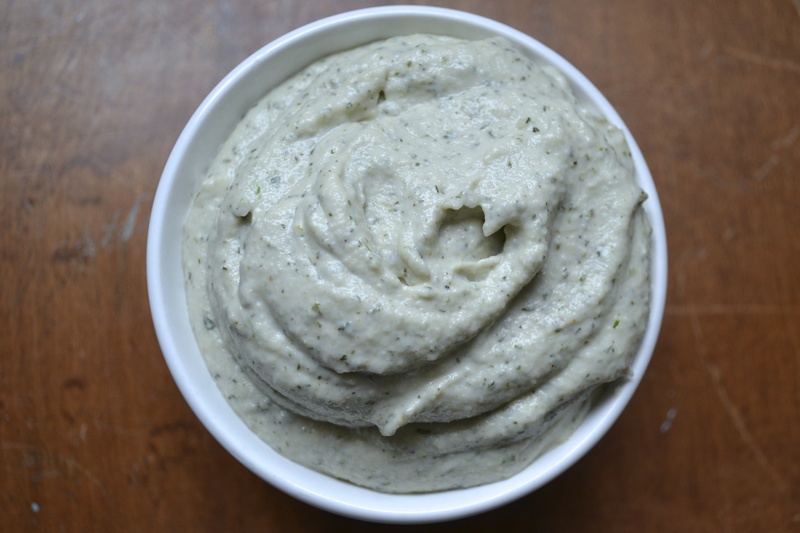 For a pool-side snack, I whipped up an easy dairy-free dip that gets its creaminess from pureed raw cashews. I made the dip dairy-free for two reasons: (1) dairy and the hot afternoon sun do not play well together and (2) my cute manly-squeeling-non-frolicing husband does not consume dairy. Add all ingredients to the bowl of a powerful food processor fitted with the steel blade. Process for 2 minutes or until smooth. Refrigerate until chilled (about an hour). Sprinkle with fresh dill and chives. 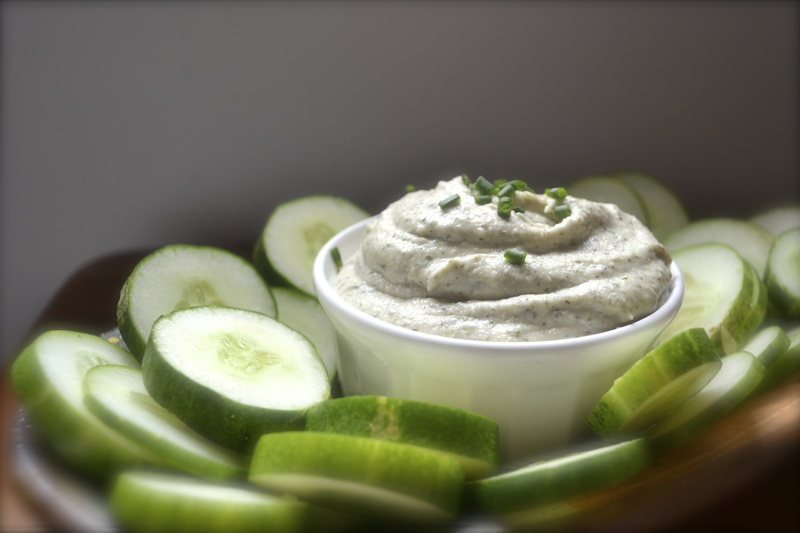 Serve with plenty of veggies for dipping! I love the sound of this dip! Dip looks delicious! We have a ton of cucumbers about ready for harvest in the garden so I’ll try this one soon! I’ve been wanting to try the cashew cream thing. Love the ranch inspiration! Cashews are magical! I’m all about it. Oh great idea. We’ve been munching a lot on raw veggies lately and that would be perfect. Bonus is that we have all those ingredients already. Definitely going to try this. Thanks! Don’t tell me there’s a shortage of pools in KC! I tried the most amazing fresh cashews in Belize and developed a newfound appreciation for them. 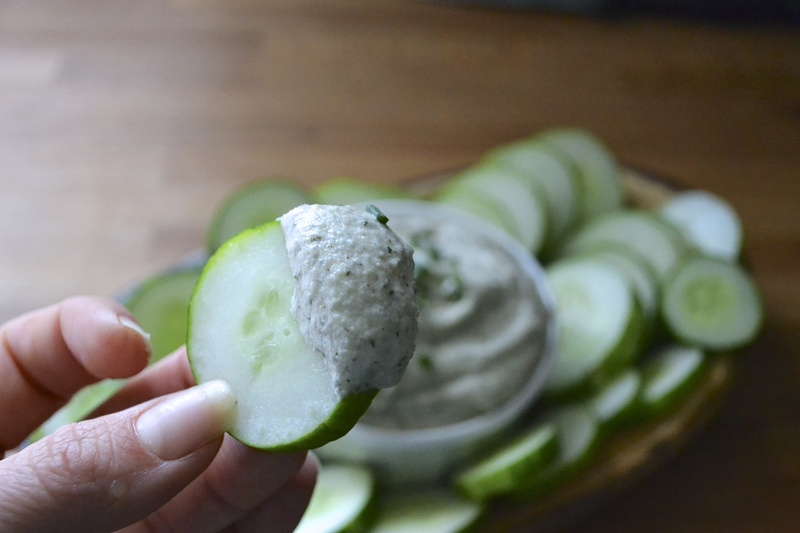 I’ve been wanting to experiment with cashew cream, too—this dip looks perfect. I just made this and wow! It’s so good. I didn’t have any dill so I just left it out but it’s still yum! I’ll be sure to add dill next time. Thanks so much for sharing this recipe!